I remember early on in my guitar days I use to haul my stuff around in a square green milk crate. I think it would hold 4 gallons of milk or something. It was easy to lug around. I use to toss my pedals at the bottom then stack all the cables on top. It was a mess, but a somewhat organized mess. Of course, I then graduated to a briefcase, we all end up with a briefcase at some point.. right? 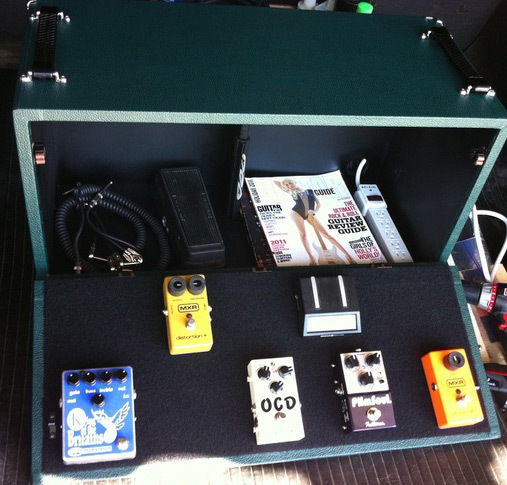 And finally to a pedal board, yet I still need a case for my cables, tools and utility pieces. This is where Rock Cr8 comes in. Where did you come up with the concept of rockCr8? One day I was jamming at home and I realized I took more time to set up and take down, and that I was losing valuable play time. I needed a way to keep my gear ready to go and quick to put away, and have things look presentable very quickly. I like to keep my nice guitars and amps in the house and jam whenever I can, but my wife doesn’t like to see my gear all over the place. What took it from concept to something you were committed to build? It was fast. I sketched it out the next day at my day job and had started building by the weekend. 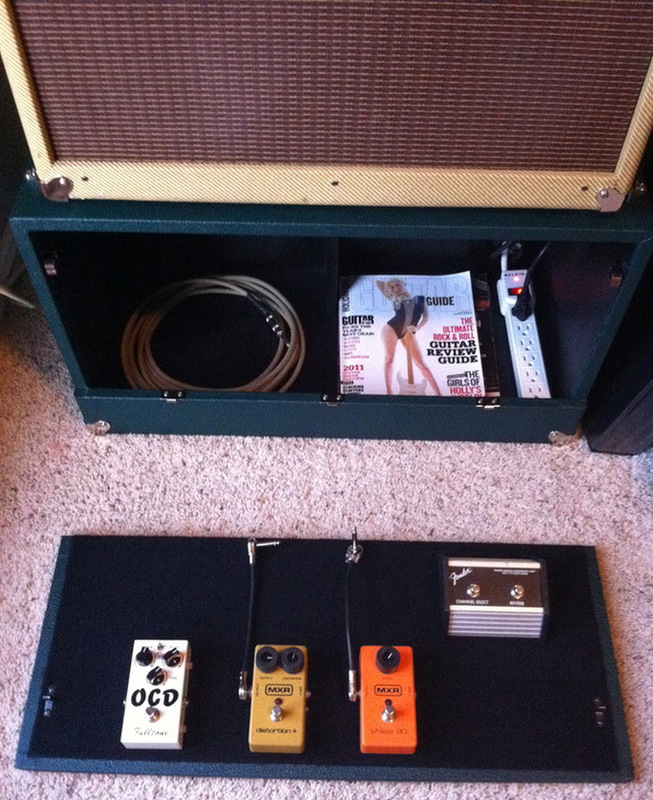 I knew I had to make a place to keep my pedals ready and also pick my amp up off the carpet. I was losing tone in the fibers and always had to tilt it back then pull out my old pedal board from the garage and put things together and that kind of made it mandatory. What advantages does the rockCr8 have over conventional pedal boards? It really kills two birds with one stone. You have an amp stand and you have a detachable pedal board for traditional use. Then you can re attach it to the mothership holding up your Amp. The kicker for me is you have a third element. You have a transportation device for all the other stuff a guitarist needs to take from home to gig. It’s durable and looks like an extension to your amp. Can you make them custom? how custom? what are the options? I have not tried anything too crazy yet but I was thinking about adding some lights in there since we have a power strip. Maybe a disco ball or some dice might be cool. We have two hinge styles. A piano hinge for the basic Rock Cr8 and a detachable hinge for the Rock Cr8 Gig. The main option is the 39 versions of tolex available to make it a nice compliment to your favorite amp. We have a couple handle styles as well. What is the turn around time to get one? I am going to keep some body’s ready to be covered to cut down turn around time. My goal is to have it in your hands asap. Week or Two in most cases. I also plan to keep some staple colors of tolex like Standard Black completed for immediate delivery. How do they compare to other pedal boards – cost wise? There is such a range of pedal boards from $50 to $400. We can do most versions of Tolex for about $175 with shipping on top of that. But it’s not just a pedal board, it’s a Cr8. Check out RockCr8.com for more information and photos of the Cr8! RockCr8 is also on Twitter, so give him a follow! the only problem I can see is that the stuff in the box might bounce around and damage the pedals on the board..
Is there some kind of foam protection between the pedal board and everything else in the box?